Confederate General Robert E. Lee was born on this date in 1807. Lee is one of my favorite characters of the Civil War, and is featured in many of my books. He was so loyal to his homeland that he gave up his commission with the U.S. Army to support Virginia when the Commonwealth seceded from the Union in 1861. This could not have been an easy decision for him. He was career military, and he was President Lincoln’s first choice to lead the Union Army. But because the country was split, Lee went with his heart and declined Lincoln’s offer. The war wasn’t kind to General Lee. He lost many relatives during the war, and told President Jefferson Davis several times that he did not want to lead the Confederate Army. Inevitably, the South lost, but Lee accepted defeat with grace and humility. He was offered the presidency at Washington College in Lexington, which he accepted. Only five years later, he died of pneumonia, presumably brought on by heart failure. Robert E. Lee was a true patriot and a devout family man. He held his religious beliefs above all else. His stamina and integrity are admirable, and his leadership ability carried his soldiers through many battles. His men idolized him with love and adoration, and compared him to King Arthur. Lee was one of the greatest generals in American history. That’s why it is such a shame that the country he fought and suffered so much for has turned against his memory. New Orleans is still debating whether to destroy the statue erected in his honor in that city. This is recurring all over the South. It is disgraceful that such a great man is depicted now in such a dishonorable light. Lee never fought to defend slavery: in fact, he set his slaves free well before the war took place. He did not believe in the institution. He fought under the Stars and Bars to preserve Southern rights and freedom, and as a declaration that his soldiers would fight to save their homes. Lee’s home, Arlington, was taken away from him during the war, but he never wavered in his faith of God and country. It is disgusting how the Stars and Bars for which he fought have been removed from his Chapel and burial place. Shame on you, Virginia, for allowing it to happen. Would that his enemies squirmed in their shame…but alas they have none. 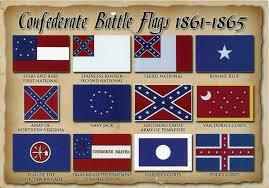 Today has been designated National Confederate Flag Day by the Sons of Confederate Veterans. If you haven’t done so already, proudly hang your flag high for everyone to see! It can be any flag of the Confederacy: the Bonnie Blue, Stars and Bars, Stainless Banner, or the Confederate Battle flag. As you can see, my little bloodhound is a true patriot of the South! Truth be told, I’m still unpacking, and it’s the only flag I could find right now, but you get the jist. So fly your flag high, and tell the world you’re not afraid to show your Southern Pride! Happy Confederate Flag Day!